The new Limerick to Galway rail line was officially launched today - reopening the rail links between the two cities for the first time in 34 years. However, some reservations have been expressed that the service does not include the populous areas of Moyross in Limerick and Oranmore in Galway. The re-opening of the rail link comes after €106m has been spent on upgrading the Ennis to Athenry line. As well as serving Limerick, Ennis, Athenry and Galway, the project involved the building and total fit out of new stations at Sixmilebridge, Gort, Ardrahan and Craughwell. Car parking facilities, as well as mobility impaired access, are also provided at the new stations. There will be five services each way starting at 6am from Limerick, with journey times varying from just under two hours to two and a half hours. An estimated 300,000 passengers a year are expected to use the service. 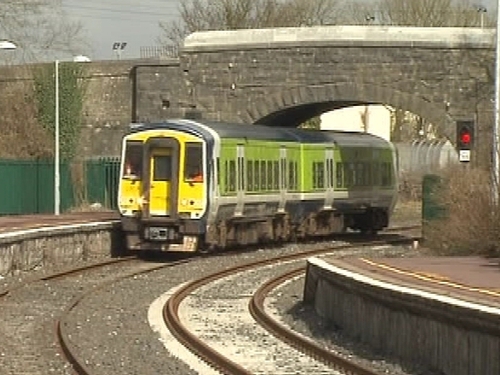 'West on Track', which has campaigned heavily, for the new service said it was important to proceed to phases two and three to Tuam and Claremorris. However Irish Rail can not say when these phases will be start given the current difficulties with the State finances.